A scientist who worked with Nasa’s Opportunity rover has honoured the fallen robot with a tattoo showing its final reading. Opportunity was officially declared dead by the US space agency after it became caught in a severe dust storm on Mars, having spent 15 years on the planet. Keri Bean from Schertz, Texas, is a mission operations engineer and worked as a tactical uplink lead for Opportunity. When the end of the mission was in sight, she committed to her inky tribute. “When we first lost contact several team members joked about getting matching tattoos when ‘Oppy’ came back,” Ms Bean told the Press Association. 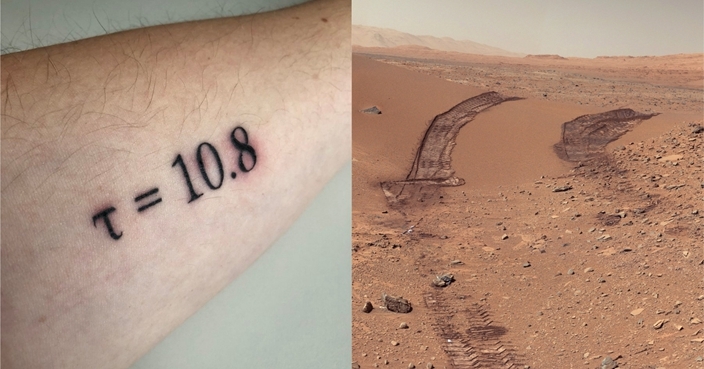 “I decided that either when ‘Oppy’ came back or when the end of mission was declared, I would get a tattoo to honour ‘Oppy’. 3/ I really believed Oppy would come back from this dust storm. But alas, Mars took her in the end. I feel guilty that I had joked as a rover driver trainee, I'd turn her into a storm chaser. I did chase storms while I was a meteorology student, after all. 4/ The team blamed me for the dust storm. Exactly two weeks before the dust storm started, I got my one and only Rover Planner shift where I was in the hot seat. I put the RAT on the surface and brushed a Mars rock. So obviously whole butterfly effect, etc. Plenty have mourned the loss of ‘Oppy’. The solar-powered rover was only expected to travel 1,000 metres on Mars, but amassed 28 miles and delivered on the search for evidence regarding water. 6/ …and cover for a colleague fighting cancer. Dawn is the project that hired me at JPL, so it was rough to lose her as well, even though she was very successful. I also went through a divorce which finalizes next week. It was a ROUGH last ~6 months of 2018 for me. However, for Ms Bean the effect on the team back on Earth has been the more difficult aspect of Opportunity’s demise to deal with. “She (Opportunity) lived a good life and lived so much longer than expected,” she said. “What has been heartbreaking is knowing the team is scattering. 7/ While Oppy may not have made it out of her dust storm, I made it out of mine. And that is worth the permanent mark on my arm. To remember in the darkest hour, the sun will come back out eventually. But while the loss of the rover marks the end of an era, Ms Bean has found solace in the public’s reaction to the news. “I’m extremely happy to see others also reacting to ‘Oppy’ with the same love and affection that I have,” she said.